Toward proof that baseball lives forever comes Heritage auction this month where a Lou Gehrig “game worn cap” is estimated to bring 200K, this part of a family consignment that has sport collectors atwitter. Imagine --- something that belonged to Lou Gehrig can now belong to you. Will the ultimate high bidder want it for love, or pure investment? Would he or she stand before a mirror and take selfies wearing the cap? There is no film memorabilia I would give two hundred thousand for, even if I had it. 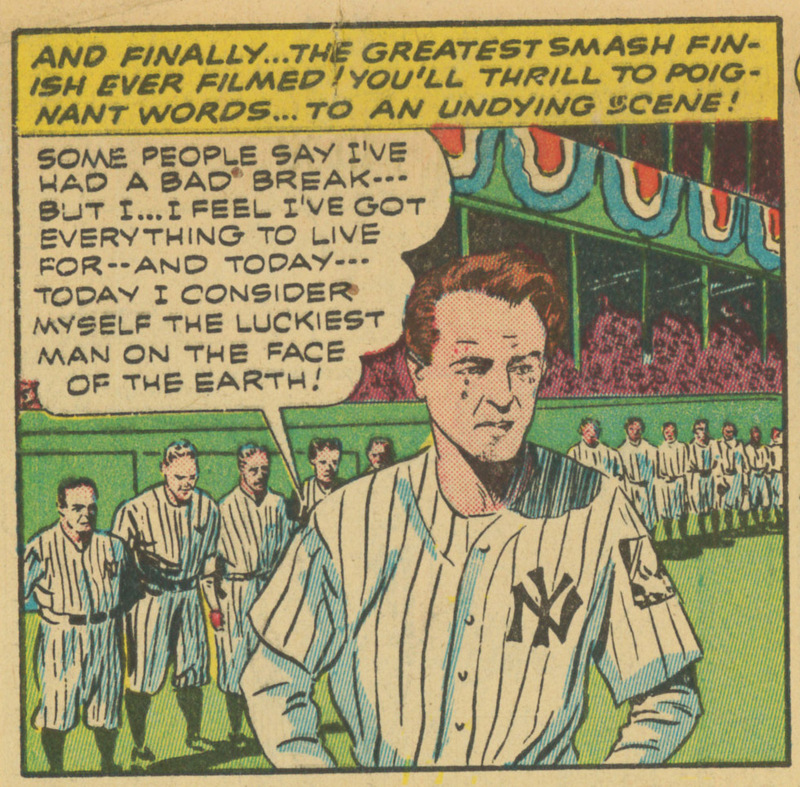 How meaningful is Gehrig? We knew in 1942. He had recently died, a nationwide heartbreak over loss of the man who otherwise could not be stopped. His appeal went past base runs and pinch hits. Gehrig stood for indomitable spirit quite beyond his game. 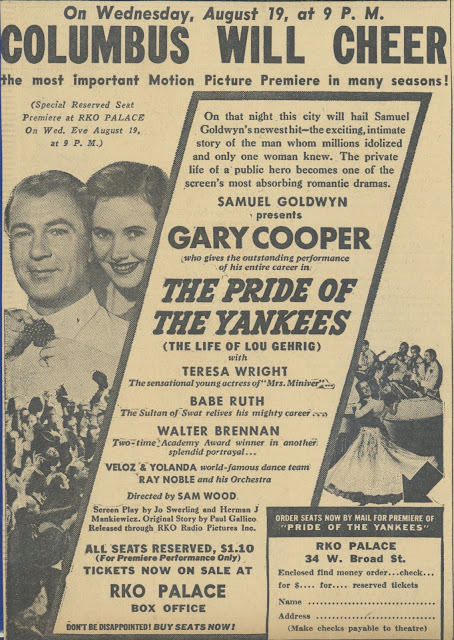 Goldwyn and RKO’s hit with Pride of the Yankees was historic. It needed bath towels to mop tears a third act brought on, this a ribbon on the “sweetest love story” man or woman had yet lived on screens. Goldwyn insisted that romance take front seat over baseball. 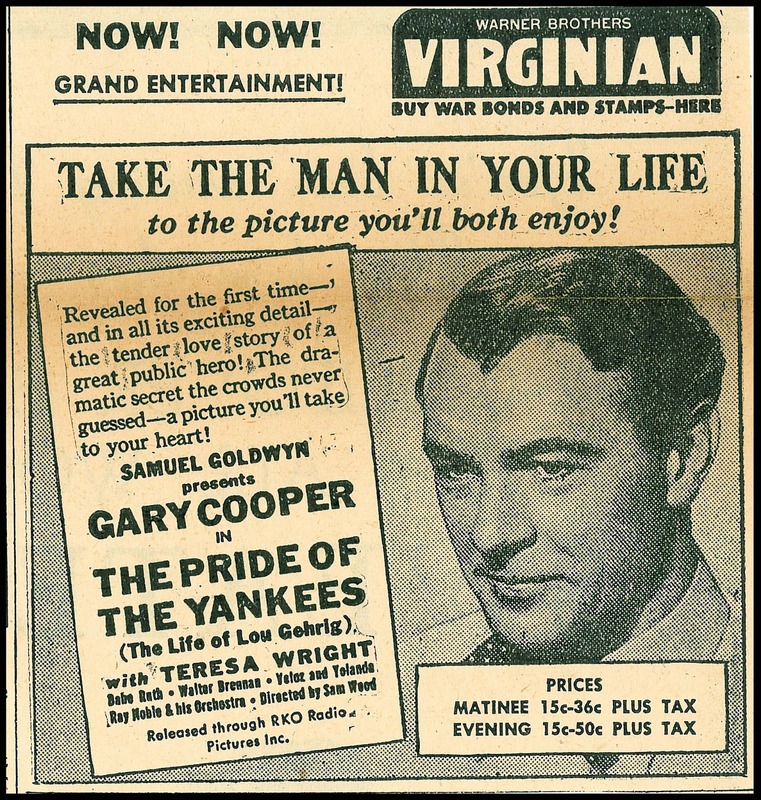 Ads put Teresa Wright at equal prominence with Gary Cooper, in art display if not billing. Pride of the Yankees would be “The Great American Story” at start of a world (war) series we had to win. More than one venue saw recent-bought war bonds as qualifier for admission. Gehrig as never-give-up guy was both inspiration and recruiter. 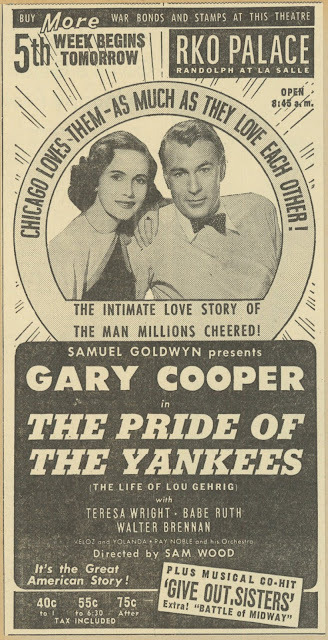 Timing got the pennant for Pride ($4.2 million in worldwide rentals) even as foreign receipts were but a third of the domestic score. 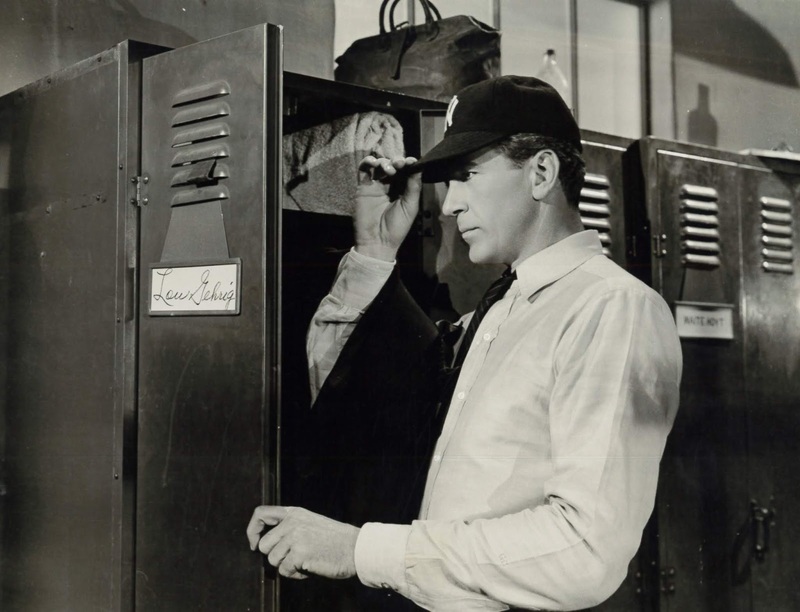 The show thrives yet with those who love baseball, Gary Cooper recalled as much for this as Sergeant York or High Noon. 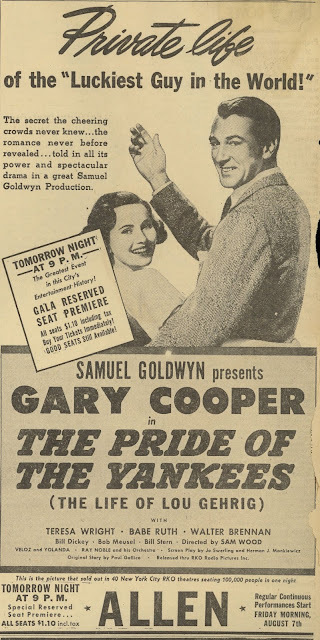 I went years not liking Pride of the Yankees because it seemed so mawkishly Hollywood. First act kid stuff with Lou batting his ball through a shop window, Ma and Pa at dueling accents from the old country, and worse, Coop in bashful mode to make it seem like some other actor did Morocco in 1930. The Code really took ginger out of him. Cooper at forty-one as frosh waiter at Columbia U won’t wash, and notion that any girl could make a chump of him is plain silly (again: Morocco). This was apparently what we wanted of Cooper by the early 40’s --- look at trial that is Meet John Doe, where he’s a dope ringed by all of most irritating support Frank Capra could locate (rooting interest here: Edward Arnold). I wish Cooper had never done Mr. Deeds or anything else for Capra. They about ruined him. Dumb-down of the persona began in earnest with Deeds and contaminates a first two-thirds of Coop as Gehrig, but come dawn of the character getting sick, and C as G becomes a finest work Cooper did, every move right, gestures keyed to rich emotional payoff. Cooper must somehow have understood a mighty man brought low, his Gehrig a best depiction I’ve seen of what creeping fate does. 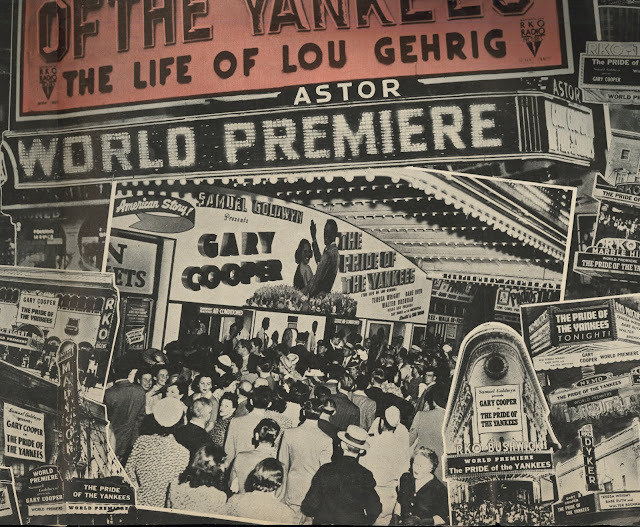 Where he entertained troops during the war, Cooper always led with Gehrig’s “luckiest man” speech, which reliably made soldiers weep. It was the most effective bit any star could put on for service audiences, a heart tug to leaven yup-nope comedy that was balance of Coop’s live act. Critic Manny Farber complained that there wasn’t enough baseball in Pride of the Yankees, and what was there looked phony. That didn’t matter, least of all to viewers, and showmen who waved tens of thousands in. 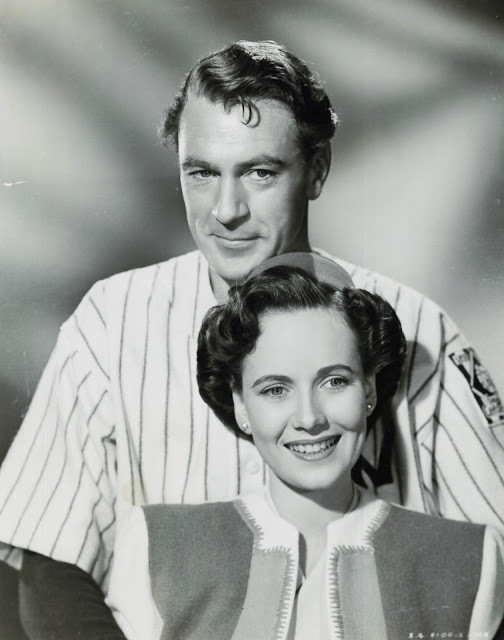 Gehrig’s personal story was the lure, that plus love’s triumph over adversity. Are we still as fascinated with illness that won’t be cured and how people deal with it? A finish sad enough will often yield happy reward at ticket windows. The curtain speech is a moistener to hardest hearts, for which we can still forgive a lot of hokum gone before. 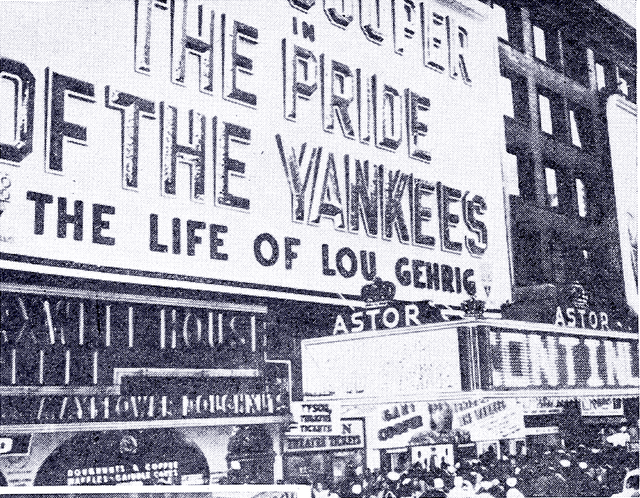 Pride of the Yankees ran fourteen weeks at the Astor on Broadway, records smashed nearly whole of the way (venue’s just-previous This Above All, also a hit, lasted nine frames before move-over to the Roxy). Samuel Goldwyn wanted prices upped on theory that his show was like steak that need not be sold like hamburger. Goldwyn also insisted that distributing RKO “exempt” Pride of the Yankees from placement on double bills, to which they complied. The Gotham premiere was glitter night for whatever celebrity was in town, be it movie, sport, or political. The date was June 15, 1942, Pride of the Yankees to launch not just at the Globe, but a total of 41 RKO circuit houses in New York, “seating capacity in excess of that which could accommodate a World Series crowd at the Yankee Stadium,” said Goldwyn publicity (Showman’s Trade Review --- 6/27/42). 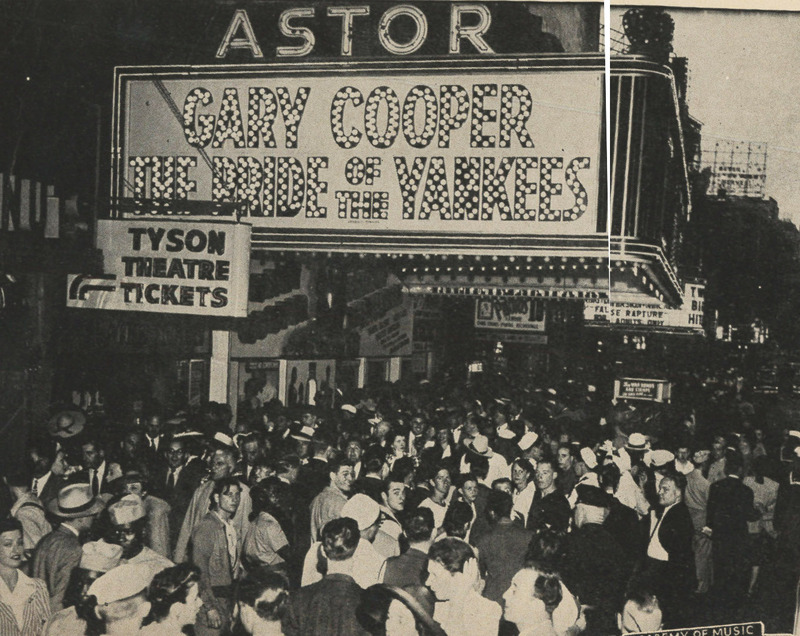 All seats for the opener were reserved, the Astor continuing with two-a-day policy throughout its run. Wartime required nightly dim-outs, so klieg lights normally used for such a gala were dark. Astor ducats ranged from $1.10 to $2.20 (Motion Picture Daily). Could You Buy Gary Cooper As A Fall Guy For The College Vamp? 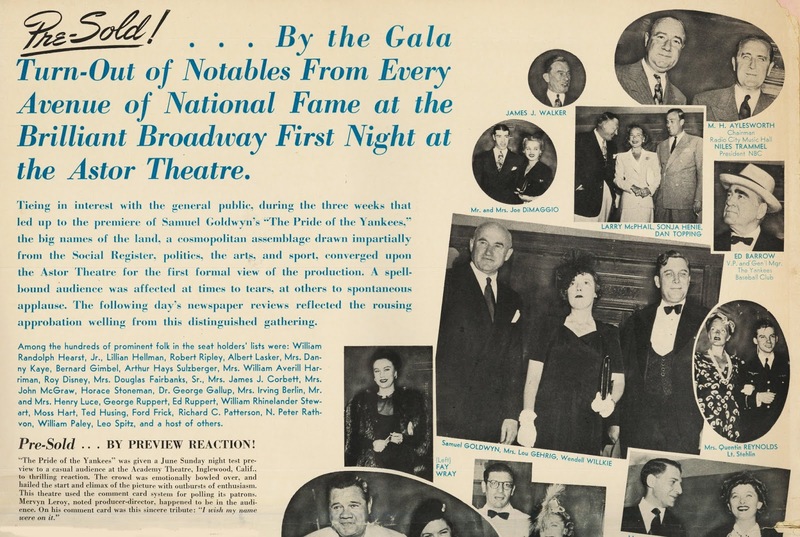 The Disney-Goldwyn Link Is Emphasized For Publicity. RKO Distributed For Both. Trades reported “long lines which waited patiently on the broiling sidewalk,” an ongoing sight during Pride’s NY run that “amazed many bystanders.” Five of each day’s seven shows at the Astor had patrons backed down sidewalks for admission. Post-summer for Pride of the Yankees was the World Series in October, which reminded patrons that the Astor was still in there pitching. Many were going back a second or third time, especially with ball season in full swing. 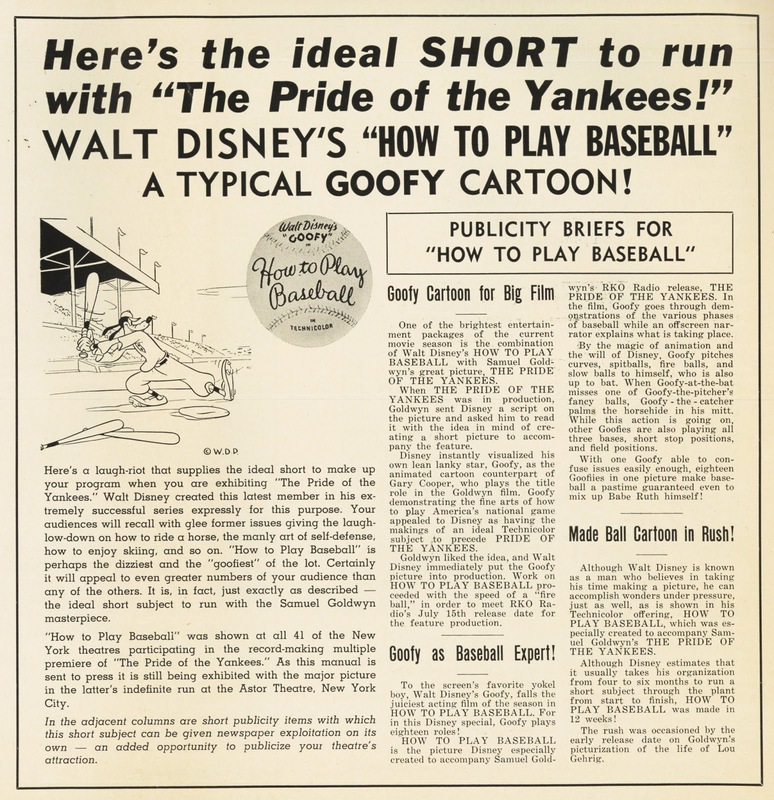 The Film Daily’s “Along the Rialto” column (10-1-42) challenged “presumptuous” designation of baseball as our “so-called ‘National Pastime’,” the game “having considerably less right, in fact, to adopt the label than the movies have.” B’ball had long been a natural enemy of Hollywood, night games a drain on local attendance, especially in small towns where popular enough teams could empty an auditorium no matter what the action on screens. 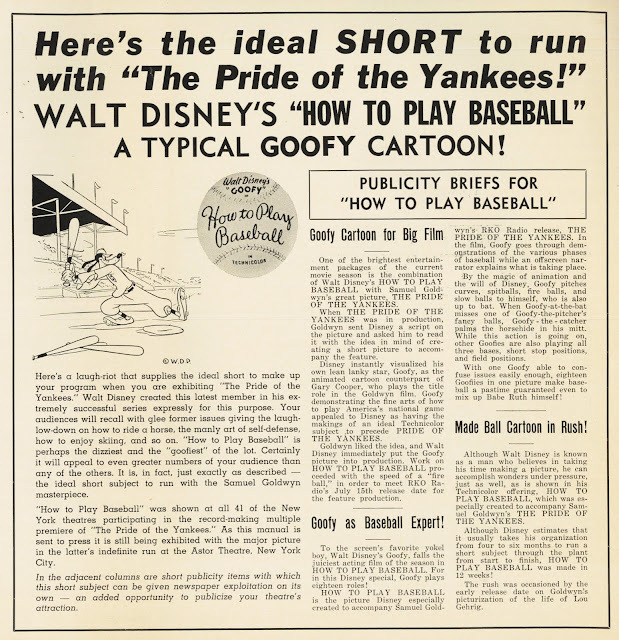 Toward thematic programming, Samuel Goldwyn asked chum Walt Disney (they socialized often) to quick-do a cartoon that would accompany Pride of the Yankees at premieres. Result was a Goofy reel, How To Play Baseball, allegedly wrapped in twelve weeks (six months to a year the usual time). 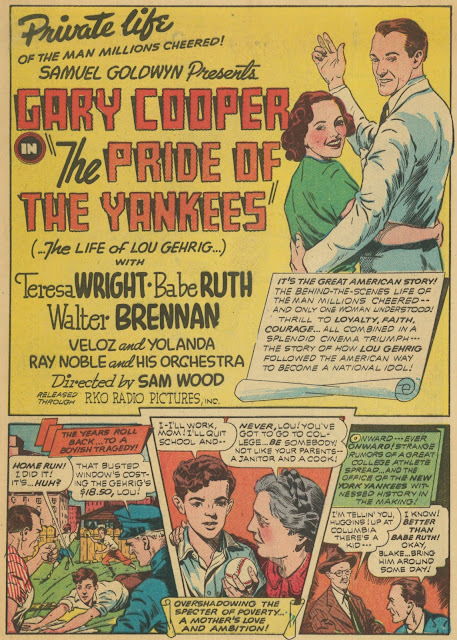 Imagine the mass that saw this short, plus a war-themed doc, John Ford’s The Battle Of Midway, that came in as September support for Pride of the Yankees. There is no Blu-Ray as yet for the feature, but TCM and HD Net Movies have run it often in HD. Stinky has to admit he is a sucker for the Cooper bashful routine. Depending on the vehicle,Stinky can find it very moving. These days, there seems to be a "teen with cancer" movie genre, which somehow romanticizes the illness, and how the victim changes his/her friend for the better before lights out. When I was a kid any movie, ANY movie, that used a comic strip style ad promotion was an instant four star attraction in my book. I loved comic strips and comic books and I loved movies. Our local paper carried the syndicated Sunday funnies feature 'Walt Disney's Treasury of Classic Tales' and I was a huge fan, even though I was often critical of the actual art in the strip. Dave K: They've reprinted a few thick volumes of the early Classic Tales; boomer appeal but very uneven (How do you make a comic strip out of "The Sword and the Rose"?). I remember reading it in the mid 60s, when the art was very bland -- I think one of the books mentioned that the studio didn't always have contractual rights to caricature actors, so faces became oddly distant from reality. Thanks, Donald B. Didn't know those existed! 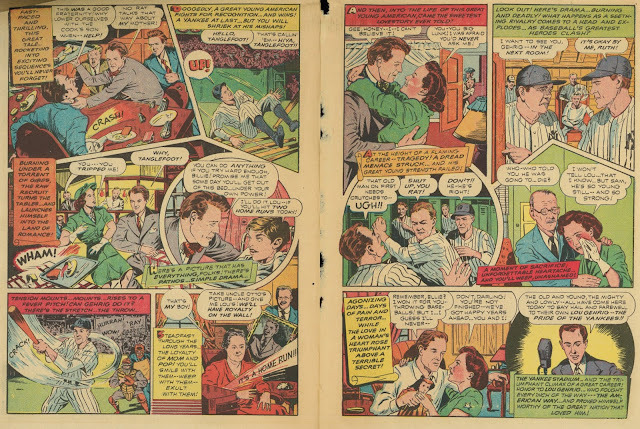 I do seem to remember hearing that much of the look of the Disney strips, and for that matter, many Dell comic movie adaptations is attributed to artist Jesse Marsh. He had a very broad, brush-y style, very generic looking. Apparently a workhorse who was crazy-fast and always in demand at Western Publishing. 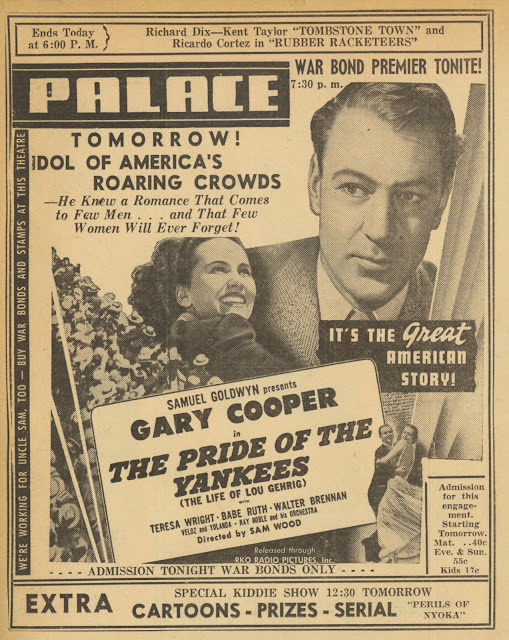 As for Gary Cooper, I'm a bit more indulgent about "Pride of the Yankees", although your criticisms can't be denied, and you have a wonderful way with words in getting your digs in. I'm glad however that you too are as touched by Cooper's simple and sincere delivery of in essence Gehrig's actual speech at the end. 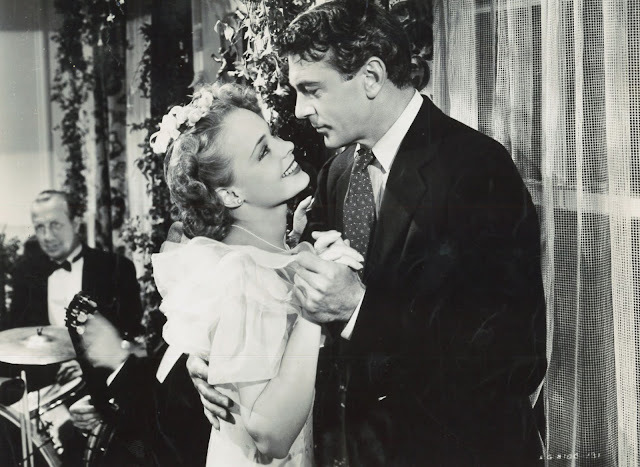 When I was young and saw Gary Cooper on TV in his old movies, I saw and noticed only the affectations, and I frankly didn't care for him. Everything seemed calculated and gimmicky. Now, here's the amusing contrast. When I grew older, I really can't account for why it is, but many of these same behaviors began to seem more and more natural to me. However, where he really impressed me, profoundly, was in his unique way of playing scenes in which he displayed empathy for other characters...even the one he himself was playing. The latter is perfectly represented by Gehrig. However, I'm extremely moved by his acting in two films in which he's present at the death of another character who he's had conflicted feelings for (as scripted), but admires in spite of that. One is played with the excellent Richard Widmark at the end of "Garden of Evil". The other is his scene at the death of Robert Middleton's character in "Friendly Persuasion". Perhaps Cooper's only peer in this kind of emotional exposure and honesty, certainly for an actor of his generation preceding the Method school, was James Stewart. I'm just generalizing and in so doing identifying another of the most loved actors of their generation and beyond, and I think it's because they had the courage to expose themselves so openly in terms of feeling and identification. There were so many other titans in their generation but I can't think of many who were as willing as they were to reveal vulnerability, tenderness, and remorse. Wonderful. I miss them so, and that's a big reason why. Capitolfest had Coop as their star of the festival a couple of years ago and showed a bunch of really early films-- a couple of silents (Wolf Song is excellent) and some talkies that followed in the wake of The Virginia, all with names like The Man From Wyoming. What was interesting was how much he was sold primarily as eye candy for the ladies, and the stories constructed around whether he would stay or go on the female lead. He had to fight his way past Paramount's preconceptions to primarily male oriented roles. Anyone know if Gary Cooper personally singled out his earlier screen-characters, personally? They seemed to have been written especially for him.